The Potters Barn offers a one-day pottery course covering the potters wheel, handbuilding, explanation of glazing and firings. The course provides personal tuition from 10:30 am until 4:30 pm and includes all materials used (firing costs on top). We normally take a one hour lunch break at 1:00pm. You are welcome to bring a packed lunch or visit one of our local pubs. We end the course with reflection on the day and the pots you have made. You can chose to have your work fired at a nominal cost if you wish. Once fired your pots can be picked up. This normally takes three or four weeks. This is aimed at giving you a “taster” session and introduction to the basic methods of pot making. However by the end of the course you should know if pottery is for you or not. But be warned if pot making gets into your blood there is no going back! Intermediate and advanced courses are also available. Because these are personal tuition sessionswe can focus the attention on your particular needs. Beginner, intermediate and advanced courses are also available. We try and have a maximum of two students to one potter. The cost for the one day pottery course is £85 per head. A half day pottery course costs £55 per head. Half days, days and multiple days are available at any time. 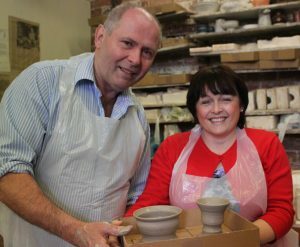 We can also purpose build pottery sessions for businesses or groups at the pottery or workplace.